It’s grim up north: but did it get grimmer with the recession? Ron Johnston, David Manley and Nabil Khattab. At their party’s 2014 spring conference in York, eight northern Liberal Democrat MPs presented a report entitled Grim up North? Rebalancing the British Economy, using it as the basis for an argument that the forthcoming budget should pay greater attention to investment that would narrow the north:south divide. Using a range of data, they showed that ‘The South has, in every single category of economic affairs spending, been cut by less than the English average’ – with the obvious consequence that the North has suffered most, and yet it has the biggest problems. Their argument was taken up by the media. The Guardian, for example, highlighted what the MPs identified as ‘fundamental unfairness’ in the coalition government’s treatment of the North – which was making it harder for the party to win seats there. The Independent backed up the story with a small amount of data indicating a north:south divide in both unemployment rates and house prices. A few weeks earlier, it had published an article by a leading economist and former member of the Bank of England Monetary Policy Committee, Danny Blanchflower, entitled The North is still not feeling this recovery, in which he said that ‘The South is seeing recovery and the rest of the country is being left behind’ – an argument based largely on house price changes. Has it got even grimmer since the recession bit in 2008? 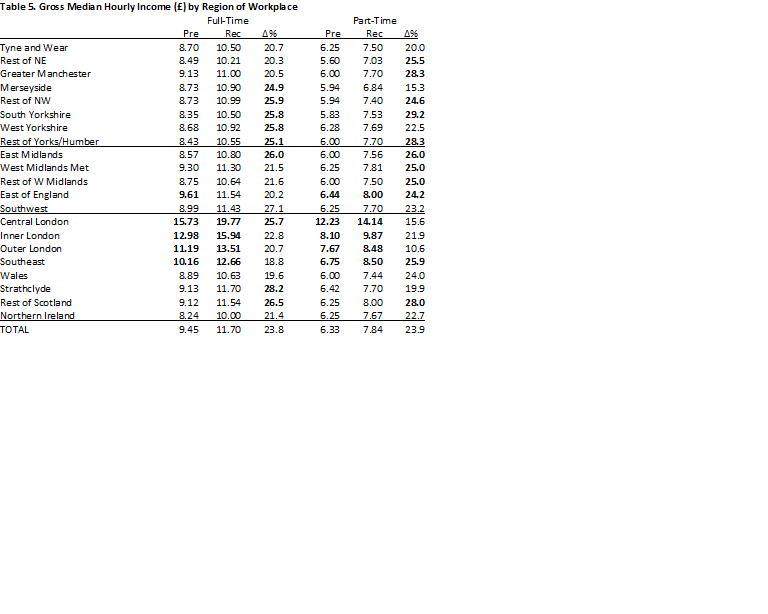 The median gross hourly income of those in work. Data for all of these are presented in the tables below, for two groups of years: pre-recession (2002-2008) and recession (2009-2013). In all of the tables, we separate out: regions in the North of England; regions in the Midlands and East of England, plus the Southwest; London and the Southeast; Wales and Scotland. For each indicator, we give the regional average for each of the two periods, plus the percentage change between the two. And in each column we highlight in bold the figures that are above the national average – given at the foot of each table. If the conventional wisdom regarding a north:south divide is valid, then the figures in bold should be concentrated in two parts of the table – the first eight rows, covering regions in the North of England; and the last four rows, covering Wales, Scotland and Northern Ireland. Regions elsewhere – notably in London and the Southeast – should have few figures in bold, since they are supposed to have the more buoyant economies, and ‘conventional wisdom’ suggested that they were less affected by the recession. 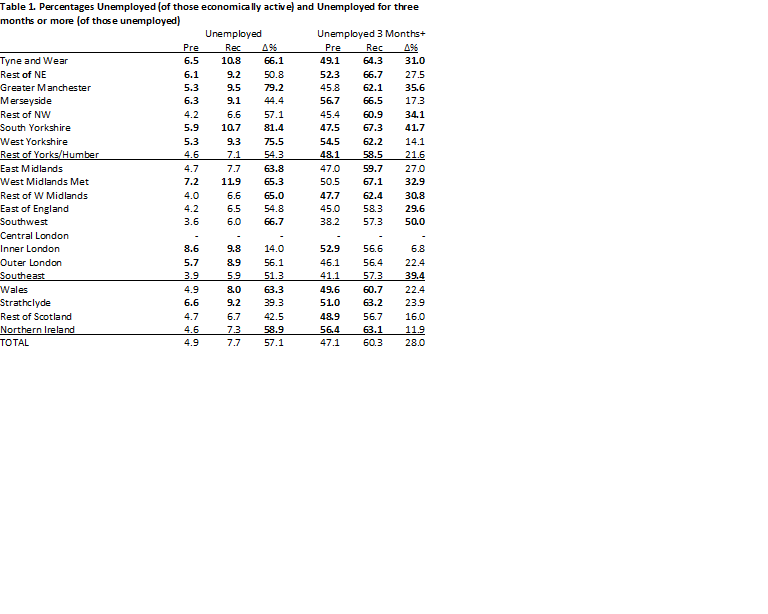 The first set of three columns in Table 1 does not show a pattern of unemployment that conforms to expectations. Whereas six of the eight northern regions had unemployment rates exceeding the national average of 4.9 per cent in the pre-recession period, with a peak of 6.5 per cent in Tyne and Wear, both Inner and Outer London also had rates greater than the national average whereas three of the non-English regions did not. Indeed, the unemployment rate in this period of relative prosperity was higher in Inner London than anywhere else in the country. Before 2009 the divide was between London and the North, on the one hand, and the rest of the UK on the other (with the West Midlands Metropolitan County and Strathclyde being the main outliers). In the subsequent period – 2009-2013 – the pattern was very similar: the unemployment blackspots were now more clearly in the northern metropolitan counties but London was not far behind, and still with rates above the national average. But the third column suggests that it did get grimmer up north in relative terms. Ten of the twenty regions experienced a percentage growth in unemployment rates above the national figure of 57.1 per cent – and the two London regions were not among them. London and the Southeast suffered less from job losses in the recession than many other regions it seemed – but so did Merseyside, the non-metropolitan northern regions and Scotland. London also experienced less growth than the average – 28 per cent – in the percentage of the unemployed who had been out-of-work for three months or more once the recession set in, although it was relatively high there in the pre-recession years. In many of the northern regions, plus Wales, Northern Ireland and Strathclyde, over 60 per cent of the unemployed post-2008 had been so for more than three months; in relative terms it didn’t get much worse there once the recession set in, but other parts of the country were catching up. London stands out (especially Central and Inner London) in these data on the geography of part-time working as having much lower percentages prior to the recession. The percentage working part-time nationally increased only slightly (by 6.6 per cent) during the subsequent recession years – and London had by far the highest rates of increase. If the recession forced more people into part-time work, therefore, this characterised London much more than areas further north; there, increased unemployment was the norm. The LFS surveys ask those working part-time if they are doing so out of choice (perhaps because they are students or carers) or out of necessity: the latter wanted full-time work, but couldn’t find any. Just under 10 per cent gave that answer pre-recession but the percentage almost doubled after 2008. As with the geography of unemployment, the pattern shown by these data is not a simple north:south divide: both before the recession and after it set in there was a split between the South, on the one hand, and – on the other – the North, plus London, plus the four regions outside England. Exacerbation of the problem was not concentrated in the latter group of regions, however, but in those where relatively few part-timers were so employed out of necessity before the slump, notably in the Midlands and the Southeast (as well as Greater Manchester). What was a regional problem became more of a national one in recession conditions. In a buyers’ labour market workers are more likely to feel constrained to take positions for which they are over-qualified than when the demand for labour – especially skilled labour – outstrips supply. 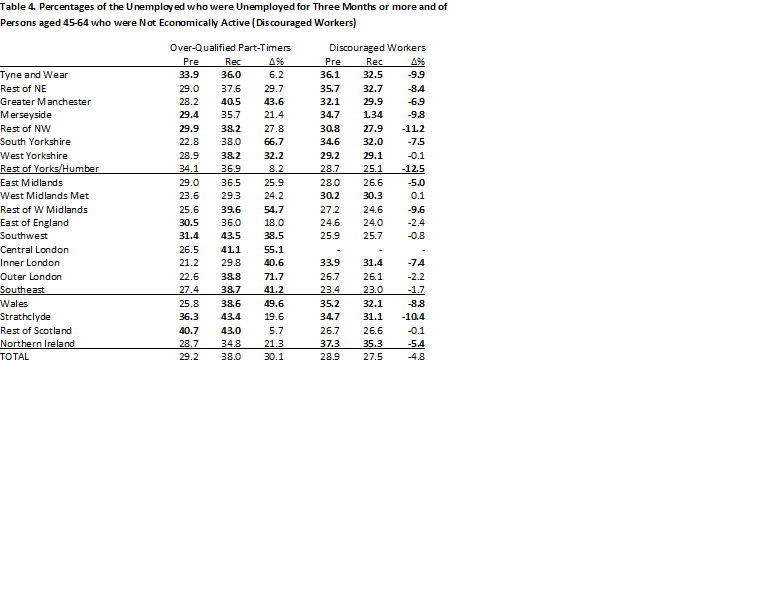 This suggests that the percentage of those in work who held jobs for which they were over-qualified would: (a) be concentrated in those regions with higher levels of unemployment and under-employment; and (b) increase in number most in those where unemployment also increased. The data in Table 3 are consistent with that argument to a considerable extent. For full-time workers, with a small number of exceptions (notably West Yorkshire Metropolitan County), holding a job for which you were over-qualified was a characteristic of over one-quarter of all employees in both periods in both the northern regions and those outwith England; the inter-regional differences were not too substantial, however, with only one percentage above 30 pre-2009 and none below 20. Although many of the northern regions with high percentages pre-2009 experienced an above-average increase in their percentages over-qualified, there was also some levelling-off of the regional differences, with large increases in London and the East of England. Among part-timers, on the other hand, most regions in the North of England experienced above-average growth in over-qualified workers – although the largest, from a relatively small base, was in Outer London. 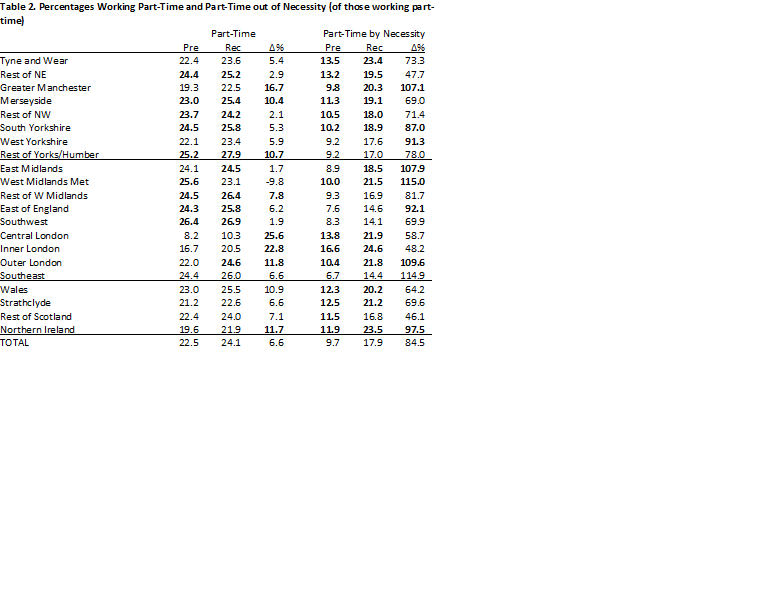 Among part-timers who wanted full-time work but couldn’t find it, there was an increase of nearly one-third between the two periods – with much of the increase being in London and the Southeast (Table 4). This is the one indicator where we anticipated a fall in the percentage involved – and it occurred: some 5 per cent less in that age group had opted out of the labour market post-2008 than was the case pre-2009 (Table 3). 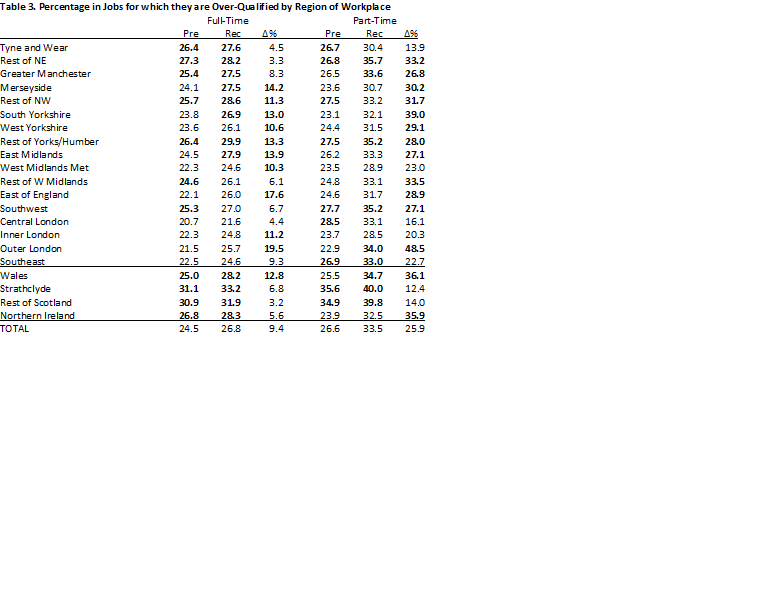 And more so than many of the other indicators analysed here, there is a clear ‘traditional’ north:south divide. Older working-age adults were more likely to have opted out of the workforce in the northern regions (many possibly because of employment-related health conditions) but less so in the recession years than previously. Were they forced back into the labour market by benefit cuts, or….? Although a substantial number of LFS respondents decline to give information on their income, enough do for the geography to be clearly delineated. Overall, in both periods, the ‘grim up north’ argument is clearly sustained. Median incomes in Central London were almost twice those in the northern regions, with that elsewhere in London and gross hourly incomes were also significantly higher for both full- and part-time employees in the Southeast than elsewhere. But the divide was not exacerbated in relative terms by the recession: median incomes grew by less than the average in most of London as well as in the Southeast for both groups of workers and employees in the North and Midlands benefited slightly more. In conclusion: grimness is not just a northern problem? There is no simple story to be told about the geography of the recession that set in after the credit crunch began in 2008, therefore. On most labour market indicators it is grim up north: it was before the recession and it remained so afterwards. But not all parts of the ‘North’ experienced worse conditions than the ‘South’ on all indicators either before or during the recession; the geography was more nuanced than that. And it certainly didn’t universally get even grimmer up north. On some of our indicators, instead of the north:south divide getting wider it got narrower – with even London’s labour markets suffering badly relative to the national situation. And so, with no simple pattern it is not sensible to go for simplistic policies – favour the North: parts of the North are indeed in trouble – but they aren’t necessarily alone, and some of the suffering is being shared across the country more widely than sometimes appreciated. It was the best of times. The UK economy was booming and mortgages could be taken out with a LTV of 125%. It was the worst of times. The house price bubble had burst and inaugurated the worst financial crisis since 1929. Fast forward five years and astonishingly the best of times seem to be coming back. Asset price inflation in the housing market is once again hitting the headlines. It’s no surprise that people want to get on the housing ladder after seeing how well their parents have done. The expectation that house prices will rise faster than other assets has been vindicated by decades of experience. Many people hoped that the experience of the financial crisis might change these expectations, but recent events suggest this is wrong. Asset price bubbles present policy makers with politically difficult choices – particularly in the conduct of monetary policy. Notoriously, the advantageous tax treatment of housing contributes to these problems. Today the most important advantage homeowners enjoy is private residence relief (PRR). In contrast to other assets, where capital gains are taxed, PPR exempts the payment of capital gains tax (CGT) on our homes. This gives homeowners an unfair advantage over those with most other assets, and encourages asset price inflation – as one is willing to spend more on assets with such tax relief. Written by a youngster this blog post might just seem like a selfish way to buy a cheap house. The experienced forty-something shakes her head explaining “although I made £50k when I sold my flat, I needed this money to move up the ladder.” Removing the PRR exemption would mean less money to put towards her next property – but her next property would most likely be cheaper! The losers from the elimination of CGT exemption will be “Last-time sellers” (LTS) – in practice the baby boomers. For future generations, the tax payments they make when they sell will be offset by lower house prices when they buy. The result is the necessary wealth transfer from the current baby boomers to the increasingly indebted youth. Moreover, the introduction of what would amount to a kind of Tobin tax should ensure the problem is never repeated. The conventional wisdom is that the exemption of homes from the current system of CGT is politically impossible to reverse. However, the elimination of MIRAS (Mortgage Interest Reduction at Source), and the recent tightening of the rules in the coalition’s autumn statement (i.e. on 2nd homes and foreign owners), demonstrate that tax reform in the field of housing is possible. Housing is not entirely exempt from taxation. Stamp Duty Land Tax (SDLT) is the transaction tax which is payable on the purchase of property. The infamous feature of SDLT is that the marginal tax rate will exceed 100% every time the price crosses one of the thresholds, because a single tax rate applies to the whole transaction. If CGT on housing is unacceptable to public opinion, SDLT is equally unpopular with economists (e.g. here, here, here, here, etc!). If it is accepted that an explicit extension of CGT to housing is politically impossible, perhaps SDLT could be reformed to incorporate an element of capital gains taxation whilst removing the distortions so disliked by economists. This reform I am proposing would incorporate two elements, which together imply that the notorious ‘cliff edge’ would be removed. The first change is that the tax would be paid by sellers rather than buyers. As every first year student knows this change should make no difference – since who pays the tax will depend of the relative willingness of buyers and sellers. However, it is not widely understood that, when buyer and seller bargain over the house price, the presence of a cliff edge tax means that this result does not hold. These cliff edges have been shown to suppress prices, so badly chosen alterations could increase house prices. The second change is that the tax paid would be paid at a constant rate, which would depend on the seller’s capital gain. The cliff edge property would be removed (since any increase in the sale price would have a constant effect) and the rate at which these capital gains would be taxed could be very different from other assets. In contrast to the current system the tax is only paid by the lucky winners, with those experiencing the largest gains paying the most. The proposal that the new tax should be paid by the seller has one further advantage. It will be much harder for the seller to “pass on the tax” by charging a higher price, than with a more conventional sales tax. This is because similar houses must sell for the same price – but the capital gain will be unique to the seller. Finally, the principal should be established from the beginning that the treasury can change the rate in response to house price inflation.